George IV (August 12, 1762 - June 26, 1830) was Prince Regent from February 5, 1811 to January 29, 1820, and King of the United Kingdom of Great Britain and Ireland and of Hanover from January 29, 1820 to June 26, 1830. He was the eldest son of George III and Charlotte of Mecklenburg-Strelitz. He was made Prince of Wales in 1762. He is often known to history as the "Prince Regent", and a period of British history and art - the Regency - covers the general period in which he held power. As heir to the throne, the prince acted with great foolishness in rebellion against his father (a Hanoverian trait). He associated with Whigs and radicals as well as drinking heavily and gambling. He had married a widow, Maria Anne Fitzherbert (1756-1837) in December 1785, but the union was considered invalid under the Royal Marriages Act of 1772 because it had not been approved by the King and Privy Council. Had permission been asked, it would probably not have been granted, as Mrs Fitzherbert was a Catholic. If the king's permission had been obtained, the marriage would have been deemed valid under British law, and the Prince, having married a "Papist" would have been rendered "forever incapable" of succeeding to the throne (under the 1689 Bill of Rights). The Prince married his cousin Caroline of Brunswick in 1795 in order to convince Parliament to pay off his debts (£650,000). This marriage was a disaster, both parties being disgusted with one another at their first meeting. After doing their official duty for a period of a few days, they lived apart for the rest of Caroline's life. Despite several periods of estrangement, the prince remained attached to Mrs Fitzherbert and rebuilt the Royal Pavilion for her in Brighton. After the birth of his only child by Caroline - Princess Charlotte Augusta - in 1796, the Prince attempted to divorce Caroline, and was prevented from doing so mainly by the disapproval of his father, the king, who sympathised with his daughter-in-law. Princess Charlotte died in childbirth in 1817, leaving George without an heir. He made no attempt to remarry, but waited until he was king to act against Caroline. He excluded her from his coronation in 1820 (she was turned away at the door), scandalising the nation. King George III suffered periods of mental illness over several decades, but the Prince of Wales was regarded as too unsteady a character to be a popular choice as regent. From 1811, his father was permanently incapacitated, and he achieved a more definite status as Prince Regent. His extravagance continued, despite the involvement of Britain in the Napoleonic Wars, and during this period, much of the city of London was redesigned - hence Regent's Park and Regent Street. The architect, John Nash, and the dandy, Beau Brummell, were among the Regent's best-known associates. When the king died in 1820, the prince ascended the throne as King George IV. He had acted conservatively as Regent and with some achievement as a patron of the arts but by the time of his coronation he was seriously overweight and possibly addicted to laudanum as well as showing some signs of the insanity that had affected his father. He spent the majority of his reign in seclusion at Windsor Castle, but continued to interfere unwisely in politics, opposing social reforms such as the Catholic Emancipation Act of 1829. As a result of Princess Charlotte's death, his younger brother, Frederick, Duke of York, became heir to the throne; however, Frederick died in 1827. King George IV died on June 26, 1830 and is buried at Windsor Castle. He was succeeded by his younger brother, as William IV. 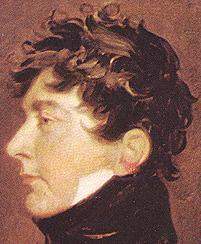 King George IV is not as often portrayed in fiction as some other British monarchs, but when he is, he is usually represented as extravagant and irresponsible. The third season of the mock-historical comedy series, Blackadder, wildly exaggerates this tendency, portraying him (during his time as the Prince of Wales) as an incompetent half-wit; however, it does explain away his extravagance as a need to continually restock the items that his dishonest butler keeps stealing.